I really stretched the theme today but I was feeling bright polishes so I went with an ever popular tie-dye. At first, I only stamped my ring finger and do I wish I stopped there. The stamping polish was very water-y but it looked ok on the stamper…until I transferred it. It would be fine if all my nails were the same…but alas, what can I do? This manicure took me a long time and I was not in the head space to start over. I hope you like it anyways! I used 1 coat of butter London Cotton Buds as my base. I tie-dye swirled with American Apparel Neon Red, Neon Yellow and Color Club Wham! Pow!, Pucci-licious, Mrs. Robinson. I stamped with Konad Special Polish in White and Bundle Monster plate BM-320. 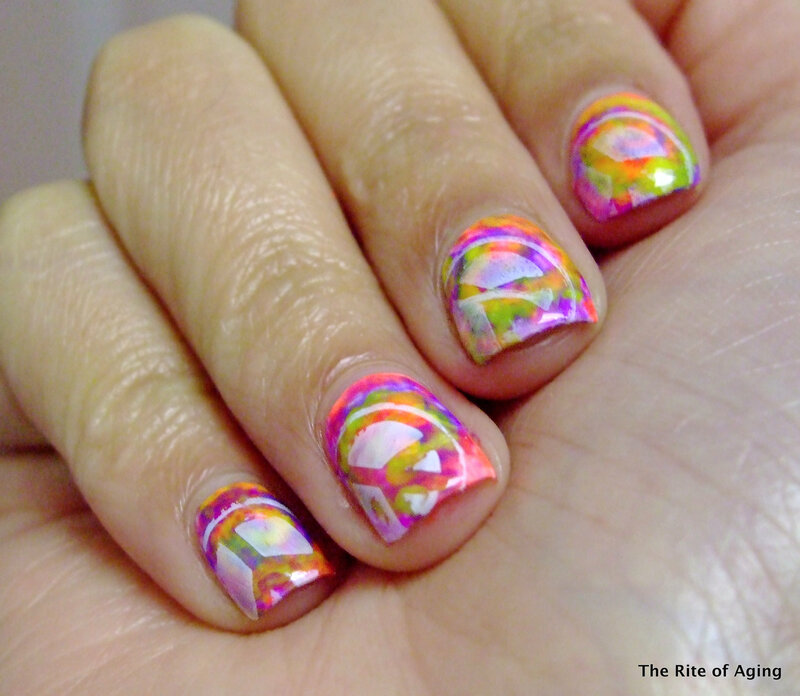 This mani is tripping, love how you interpreted the theme! Thank you so much!! It’s funny I’m not a huge fan of rainbow tie-dye…I just never think the colors work together…weird, right?